Probably the only Suzuki I'd ever buy. Too bad they're pretty much impossible to find. Like 'Andy Cappo' said above,when they say 64hp, its at the wheel. Every car is estimated at the flywheel (because it sounds better) so the cappo is more like 74hp or more at the flywheel. To meet the kei regulations, they basically lied. This car will take most cars at the lights. I myself have beaten a type-r integra, a high torque n/a twincam corolla, and a 1.6vti/vtech civic off at the lights. So how do your estimates stack up now then? The top speed of 125mph is verified, there is no doubt. almost any piece of crap 1ltr can touch the 100mph mark, I had a vw lupo and it was made of cast iron, yet still hit the 100 mark for a 1ltr n/a.... so why do you continue to say that a 657cc 3cyl 12v turbo running at 0.88bar boost producing 47RWKW cannot get to the 125mph mark? I don't think there were any such changes between the Type 1 (JDM only) cars and the Type 2 cars (which the UK models are). There was an engine change from the F6a to the K6a in the Type 3s but the figures here certainly aren't from those cars. The data probably depends on the version. A non-cat, early Jap model is going to be nippier than a late UK model for example. It also has an official kerb weight of 700kg not 725kg. mid-8 seconds is possible in perfect conditions(good shifts and sea level), but I'd say 9ish every other day of the week, for a stock cappo...but mod it even a bit and there is a world of difference the car is sadly very restricted in stock form. Georg 11.3sec to 62mph is the slowest time i've ever seen reported..... many of the UK car magazines tested it with results varyin widely from 8.5 to 10.5. Apart from you obviously liking those figures more I don't see why they are any more trustworthy than any others. After all it says it does 0-100mph in -1 seconds. That's pretty impressive! It also states an incorrect top speed as they are electronically limted to around 85MPH. have corrected the data to this information ...sounds much more realistic for such a underpowered toy.. The reason the figures probably don't stack up could well be down to the fact that it looks like Suzuki bent the rules slightly. 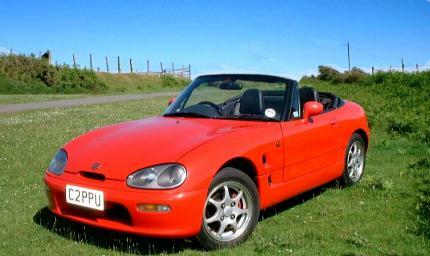 As a Kei car the Cappuccino is only allowed to produce 63bhp. It actually produces 63 hp at the rear wheels according to recent dyno tests. Top speed delimited has been recorded at 125mph (GPS validated). All this is irrelevant however as straight line speed is not what the Cappo is about. It handles like a go-kart and holds its own against much faster cars in the bends. That's where the real performance of the Cappo shines. Admittedly 62mph in 8 seconds is optimistic but as a former owner I can hand on heart say that sub nine seconds is realistic. 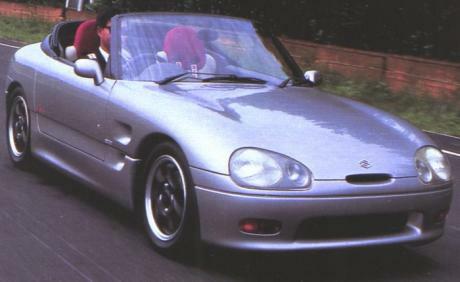 http://www.fastestlaps.com/index.php?page_id=lists&cat=ratio&size=all Take a look at all the other cars with similar or even better power/weight ratio close to Suzuki Cappuccino in power/weight list. None of them accelerate from 0-100 in 8 seconds. Funny but power/weight ratio that Racer mentioned can not back up the unbelievable 0-100 km/h acceleration figure. This car (http://www.fastestlaps.com/car486bcb9a46ba9.html) has better power/weight but it has 9,6 second 0-100 time. I really don't think this Suzuki gets 100 in 8 seconds. And I also find it hard to believe that it can exceed 100 mph in top speed. 85 mph is more realistic. Would you like a coffee with your car sir? AERO -- the reason it accelerates so quickly is due to the extremely low curb weight. It's simply physics really -- the less mass to move, the faster you can generate inertia, hence faster acceleration. That's why Lotus' cars accelerate under 6 seconds... Frankly, I'm surprised it takes this little demon 8 seconds to reach 60MPH. I'd wager with a new intercooler, and some tuning (with maybe a little more boost) it would be a real gorilla at the street lights. Where are you guys going? 0-100km/h in eight seconds?! With a standard car?! Somehow I don't think so. The standard car won't break 0-100km/h in under 12 seconds let alone eight. Where did this data come from? I own a standard ea11r cappuccino, and it is restricted at 87mph. Unrestricted it will get to 125mph on a flat. The cappuccino is still much smaller than an elise in width and length. At that speed aerodynamics is the enemy. I'd give it a 90 maybe 100 mph. Unrestricted top speed could be something like 100 - 110 mph. 85 mph is definitely not the real top speed.